The final weekend of October positively burns with activity, from spectacular seasonal fare to sports extravaganzas to Halloween hullabaloo. How does a person even find time to look at birds? I was able to spare a few moments to appreciate the Northern Cardinals that, while always present at my home, seem so much more welcome once days turn gray. Corey’s Best Bird of the Weekend was either of the two amazingly cooperative Eastern Bluebirds he came across on Saturday morning in Kissena Corridor Park in Queens. They sat right out in the open and allowed for extended digiscoping opportunities. Sweet! 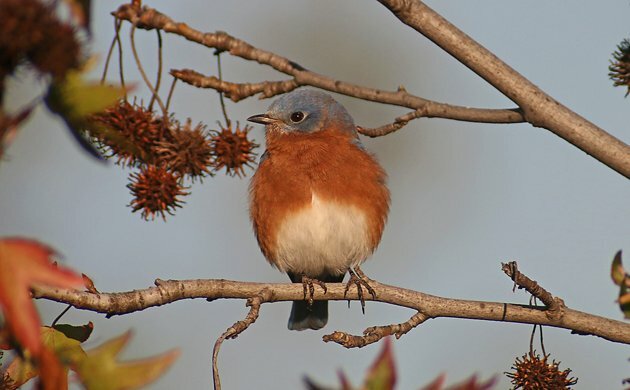 I’m voting for Eastern Bluebirds too. The only time I had for birding the weather was stormy and most birds had sought shelter. Still a flock of bluebirds was nice. Read about them and much more on my blog which you can find by clicking on my name above. Nothing wrong with bluebirds as your bird of the day! Great image of a bluebird. None of those in Costa Rica but I got one of my best birds of the year on Sunday morning in the form of a Maroon-chested Ground-Dove at 3,000 meters on Irazu Volcano. Super rare, super tough, and it let me get photos. Yee-haw! Now that is is a bird to be jealous of!